The Patriots are back to work on the field, for the first time in 2016. The individual offensive and defensive units are back to work this week. Phase III of OTAs began yesterday and the team may hold up to 10 organized team activities as the team building exercise enters the next phase. OTAs are mainly passing camps without pads…unless you’re a member of the Ravens and there is only so much that can be garnered with the team in shorts and t-shirts. But here are five things that we feel the team will want to accomplish this week. The media won’t get their first glimpse of the players on the field until Thursday, the week’s last practice session. 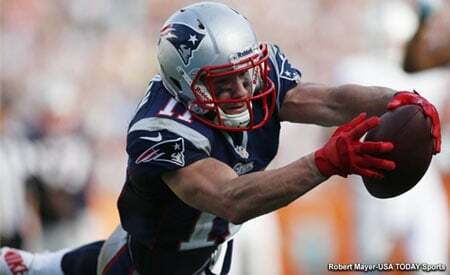 Who Steps Up at WR without Edelman and Amendola? The two biggest weapons for Tom Brady will not be out there, so this is a great time to see who is getting the lion’s share of the early reps and who steps up. There is no shortage of subplots in this story line. Will Aaron Dobson finally step up to the big stage and be able to stay healthy long enough to actually contribute? Or will he get injured again and fall by the wayside in what has to be his final audition at a roster spot. Rookies Malcolm Mitchell and Devin Lucien will be looking to show they actually belong and the passing camp in May is a nice way to show that the team was justified in giving them a shot. Veterans Chris Hogan and Nate Washington will be looking to wrestle control of the “starting spots” early in camp as they want to immediately begin to build rapport with Brady. Both Keshawn Martin, and Chris Harper, with time in the system, have an advantage that the newcomers don’t possess yet and that is familiarity with the offense and Brady. Will it be enough? With no pads and no hitting, the onus will be on the cornerbacks to cover the WRs without the benefit of jamming them physically at the line. All three starters, Malcolm Butler, Logan Ryan and Justin Coleman return but the latter two will be pushed hard this spring. Veteran E.J. Biggers and last season’s camp standout Darryl Roberts will be looking to carve out early reps and top draft choice Cyrus Jones is sure to get plenty of early reps. The team brought in a lot of smaller, athletic corners as UDFAs including Jonathan Jones, Cre’von LeBlanc, and V’Angelo Bentley. No one outside of Butler and Jones, courtesy of his draft position is guaranteed a roster spot, so the competition should be intense and fun to watch here. While it is still early, we’ll get some idea of how the offense of Josh McDaniels plans on utilizing some very talented tight ends. The Patriots already possessed the most talented TE in the league with Rob Gronkowski but added in Martellus Bennett and Clay Harbor this spring. Bennett is a huge target at 6’6, 273, and is just two years removed from a 90-catch season. He and Gronkowski have the ability to make themselves a potent 1-2 punch that will be sure to fill many a defensive coordinator with sleepless nights this season. Add in the multi-faceted Harbor who will probably function as the “Move” tight end this season and the Patriots have three huge targets in the red zone that can attack the seams, find soft spots in zone coverages and create mismatches with size. This promises to be an intriguing group in 2016.
Who is the early pass-catcher out of the backfield? With Dion Lewis out until at least training camp if not beyond, the eyes will be on the running back that can best function as a pass catcher this early. With the running game a non-entity due to no pads, the passing game will be obviously in focus. 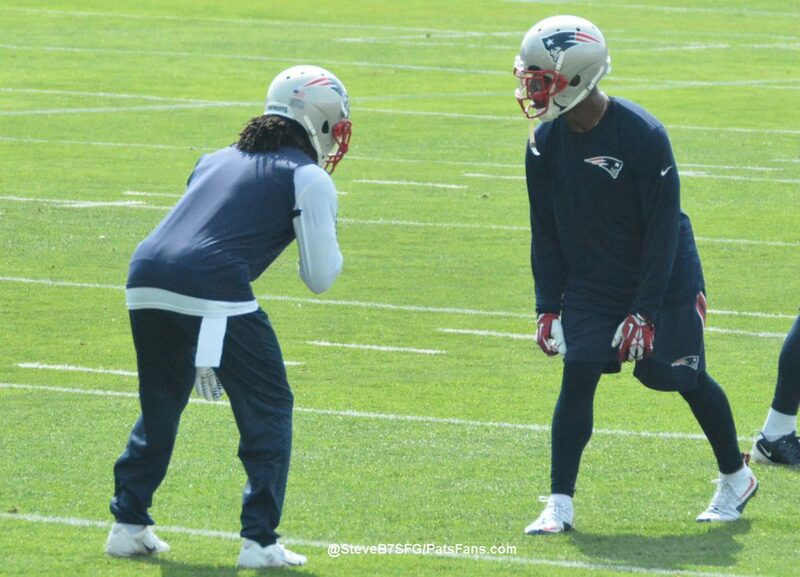 James White has the most experience and should get the majority of early reps but his position is hardly secure. The team brought in veteran Donald Brown who is experienced and steady if unspectacular and he’s looking to carve out a role. He is a good pass blocker as well as a receiver and can carry the ball a bit as well. The wild card here is UDFA D.J. Foster. He’s an electrifying player out of the backfield and is very good in space. It will be interesting to see if he can begin to carve out a small role for himself. While not much at all can be learned from the play in the trenches with no pads on, one can forget trying to make sense of who is playing well at the OL and DL positions. While their position exercises will be an area to watch, where one can evaluate their movement, that is about all one can do until the work begins in earnest in training camp. But we can possibly get some insight as to how the team envisions using the big men by watching the personnel groupings and formations early this spring. As with any year in OTAs, the looks will mainly be vanilla with little exotic looks but it is a start. We’ll be intrigued to see if the team throws Joe Thuney right into the mix at guard where the team is deep with numbers but not necessarily talent. 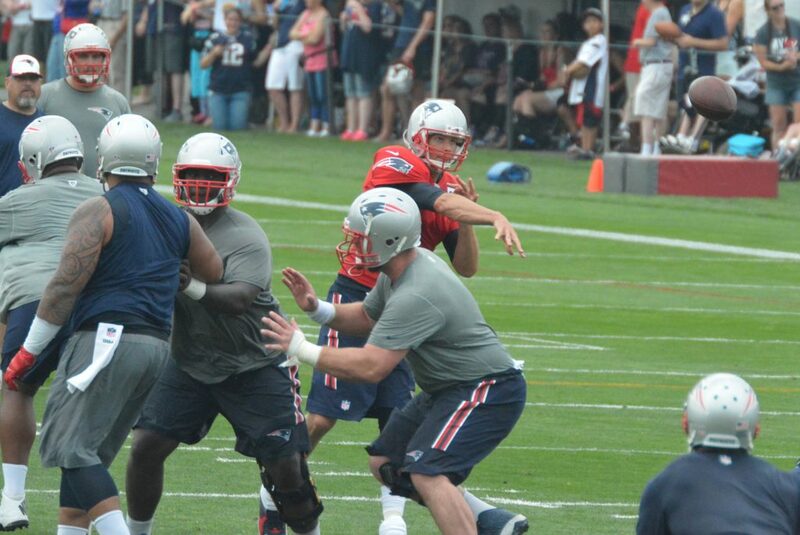 Will both starting tackles Nate Solder and Sebastian Vollmer be on the field this week? While there is nothing overly dramatic about the first week of OTAs, it is a building block to more things to come. Bill Belichick is sure to state much the same thing as the team takes the field for the first time in 2016. 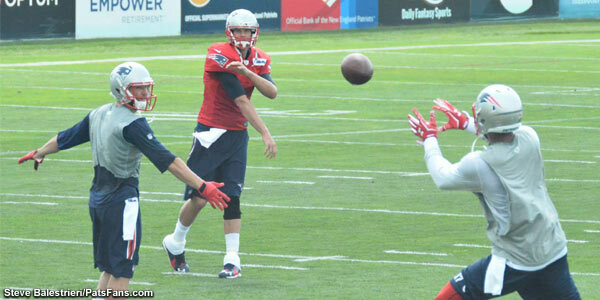 This entry was posted in Patriots Commentary, Patriots News and tagged 2016 Patriots Roster, 53 Man Roster Projection, Bill Belichick, Chris Hogan, Clay Harbor, Cyrus Jones, Darryl Roberts, Jonathan Jones, Logan Ryan, Malcolm Butler, Malcolm Mitchell, Martellus Bennett, Nate Washington, New England Patriots, NFL, OTAs, Rob Gronkowski, Tom Brady on May 24, 2016 by Steve Balestrieri.